This project ended successfully on 16/11/2016 09:00! You will receive a greetings mail with the news of our project. You will receive a personal video with greetings from us during work at the Kattaikkuttu Sangam. Lalalalalaaaa!! You will receive a special song dedicated specially to you! You will receive a post box from India with indian henna, to design the tattoo of your dreams at home! Congratulations!! We will send you a UATAUEIST T-shirt. ..the next summer is coming... for sure..
Do you like spicy food! We will send you a magic box with a set of indian spices and a cooking book. Surprise*** We will send you a special box full of surprises direct from India! You will receive an Indian Sari ( 6m handmade fabric) direct from Kanchipuram the center of the traditional Sari fabrication in India. Wow you are a UATAUEIST fashion fan! We will create a recycled bag made out of plastic from India and send it to you! Do you like to move? You want to move people around you? We are happy to give a Physical Theater-Workshop (3h,max 20 person)for an occasion you are free to choose. Hurray! Thank you so much! We would like to thank you personally. Do you have a garden, garage, big living room? 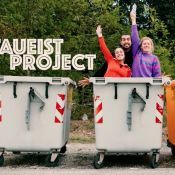 We are happy to perform our show PLASTIKKATTI for you, your friends, family and colleagues!